Mega Hitmonchan in game: 43 Who? Important notice! Pokemon Mega Hitmonchan is a fictional character of humans. Hitmonchan is a tan, humanoid Pokémon that is exclusively male. There are five blunt protrusions on top of its head, and it has extensions resembling pads over its shoulders. It appears to be wearing a light purple tunic and kilt, as well as red boxing gloves and light purple boxing shoes. 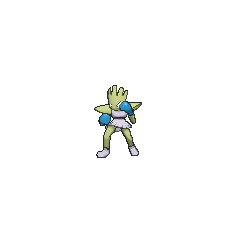 As this appearance suggests, Hitmonchan specializes in punching. It is able to throw punches too quick to be seen with the naked eye. By punching with a corkscrew motion, it is even capable of drilling through concrete. 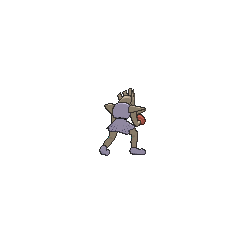 However, Hitmonchan requires a break every three minutes while fighting. Despite the need for frequent breaks, it has an unwavering spirit and will never give up in a difficult situation. Usually found in urban areas, it is rarely seen in the wild. Hitmonchan's first appearance was in The Punchy Pokémon under a Trainer named Anthony. He was entered in the P1 Grand Prix, but ended up losing to a Hitmonlee stolen by Team Rocket because the match was sabotaged. During The Lost Lapras, one was owned by an obnoxious Trainer that used him to attack a beached Lapras. 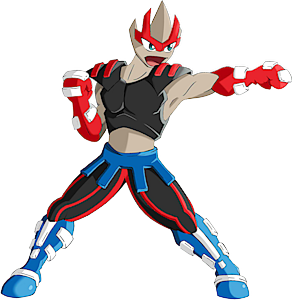 In Stage Fight!, Hitmonchan was a major performer in a Pokémon show, where the plot was around a boxing match between him and a glove-wearing Machoke. In Chikorita's Big Upset, one was part of a group of Fighting-type Pokémon that roamed the streets of the city as a gang. In A Tyrogue Full of Trouble, Black Belt Kiyo owned one and fought alongside him to break a rolling boulder. He later used Hitmonchan in battle to attempt to capture a wild Tyrogue. In Gotta Catch Ya Later!, one was used in battle by one of the Invincible Pokémon Brothers. In Showdown at Dark City, he was one of the Pokémon owned by a Yas Gym Trainer. In Riddle Me This, Hitmonchan was one of the Pokémon shown in an exercise Gym. Team Rocket tried to steal the group of Fighting-type Pokémon, but were stopped by Ash and his friends. Bruno used a Hitmonchan in To Master the Onixpected!. A Hitmonchan under the ownership of an unknown Trainer, appeared in Friends to the End, during the closing ceremonies of the Indigo League. A Hitmonchan was among the Pokémon controlled by Cassidy and Butch in Pikachu Re-Volts. Rudy had a Hitmonchan in Misty Meets Her Match. Hitmonchan also appeared in The Power of One. A Hitmonchan was seen in a dojo in Wired for Battle!. Two Hits and a Miss featured a Fighting-type dojo where one of the many Pokémon was a Hitmonchan. A Hitmonchan appeared in Beauty and the Breeder where he participated in a Pokémon beauty contest. In Extreme Pokémon!, a Hitmonchan appeared with his Trainer, participating in the Extreme Pokémon Race. Crystal is seen with a Hitmonchan nicknamed Monlee which he first appeared in Slugging Out with Slugma, in her capture team, who is capable of blindingly fast punching attacks. In Lively Larvitar, the origin of Crystal's Hitmonchan is revealed: he, along with Crystal's Natu, Parasect, and Cubone, were wild Pokémon living in Mt. Mortar and had fought with a local Arcanine that had gone berserk from a severe eye injury. Hitmonchan became Crystal's arms while hers were being healed. Bruno has a Hitmonchan which first appeared in Punching Poliwrath. He is capable of using Fire Punch, ThunderPunch, and Ice Punch at high caliber. Bruno remarks that Hitmonchan is like having three Pokémon in one. A Hitmonchan statue was seen in Cianwood City Gym in Scrappy Skarmory. 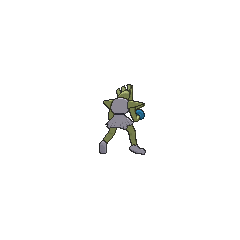 In The Last Battle XIII a Hitmonchan was one of the Pokémon sent to help the fight in Ilex Forest. It composes shock waves around itself that make Pokémon Paused. 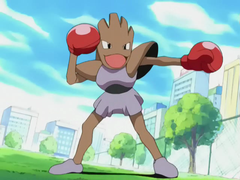 Hitmonchan may be a personification of boxing. 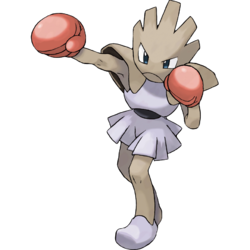 The colors of Hitmonchan's gloves in its normal and Shiny colorations are a reference to the red corner and blue corner in boxing. Its Gold, HeartGold, Generation V, and X Pokédex entries mention that it needs a short break after fighting for three minutes, which is a reference to the duration of rounds in boxing.